When Aidan O’Hara first visited the Cape Shore in 1975 there was only a single dirt road that dead-ended in Point Lance. Branch, shown in this photograph, was the penultimate stop on that road (photo courtesy of Aidan O'Hara; used with permission). 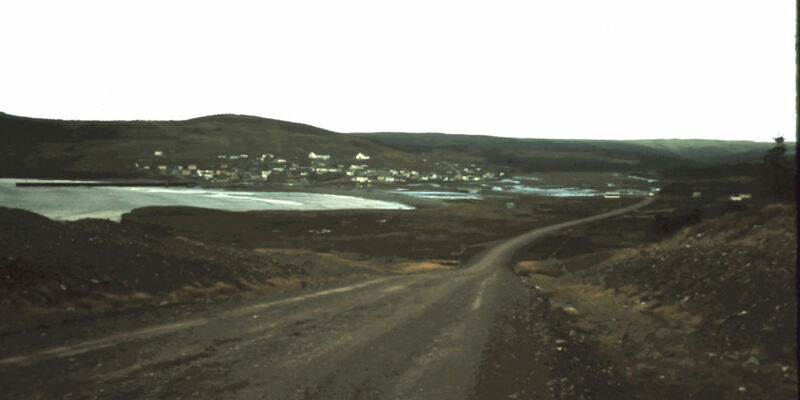 Caroline Brennan—or, Aunt Carrie as she was affectionately known—of Ship Cove was one of the first people whom Aidan O’Hara met when he visited the Cape Shore in October 1975. The Brennan household was a frequent stopover for people travelling to Placentia from Branch, Point Lance, and all along the Cape Shore. Frequent visits meant that there was always a story being told and a song or two being sung. It was a natural place for Aidan O’Hara to begin learning about the old songs, stories, and the history of the community. Aidan O’Hara and his family visit Caroline Brennan at her home in Ship Cove. 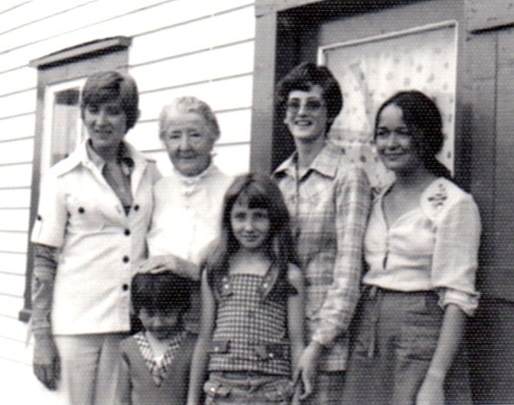 Standing left to right: left to right: Joyce O’Hara, Caroline ‘Carrie’ Brennan, Lucy Nash and Ginny Preston. 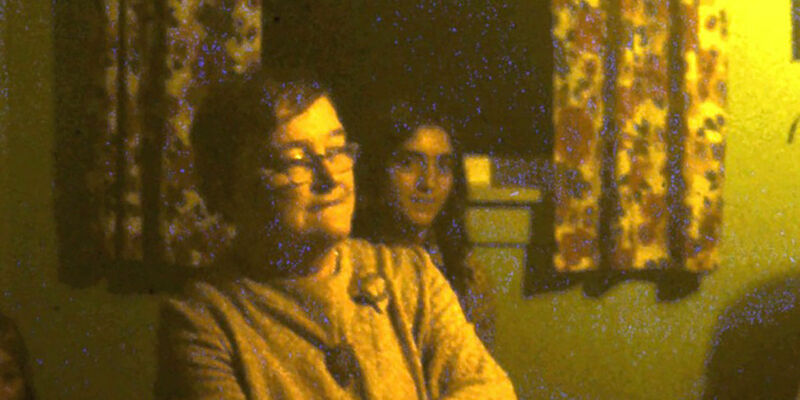 In front are Caroline and Paulette, daughters of Lucy Nash (photo courtesy of Aidan O'Hara; used with permission). Caroline Brennan had a vast store of songs and stories. Some of those songs told of tragedies. The schooner Annie, song (Young and old I pray make bold, and listen to my tale ...) Composed by Peter Leonard (1890–1964) under the title “Jim McCarthy,” this song recounts the story of a ship (the Annie) that left St John’s in 1915 with a cargo bound for Placentia Bay. The schooner was caught in a gale and, despite the best efforts of the crew, was eventually lost. The crew, however, was rescued by a passing ship, the Monarch. Others told of romance in a bygone era. And some songs were purely for fun. The scolding wife, song (I got married to a scolding wife about twenty years ago …) This broadside ballad is well known on both sides of the Atlantic (Guigné 2016:326). Though typically received as a comic song, it treats of a difficult theme: an abusive wife and the misery she brings on her husband. Commenting on Caroline Brennan’s version of “The scolding wife,” Virginia Preston Ryan notes that the songs served particular purposes. Lives working in the fisheries and farms of the Cape Shore were often hard and came with their fair share of tragedies. These hardships were reflected in the serious songs of many singers. But comic songs and ditties also had a purpose. They remind everyone that life must not be taken too seriously. They reintegrate people in the present. They get everyone laughing, clapping, and tapping their feet, and provide the needed release from the sober thought and heavy concentration induced by a song of homesickness or of loss-at-sea. One such ‘silly song’ tends to lead to another. But they eventually pave the way for another slow song or ballad and composure is restored. Between 1975 and 1978, Aidan O’Hara spent countless hours in the company of Caroline Brennan, listening to her sing, but also learning about the history of the Cape Shore. She told him about superstitions and described the many ways in which Irish sayings and customs remained integral parts of life on the Cape Shore. During an early visit to Caroline Brennan, her niece Rita and nephew-in-law Dermot Roche called in. This was the beginning of Aidan O’Hara’s life-long friendship with the Roche family. On each subsequent visit to the Cape Shore, Aidan—and sometimes his wife Joyce and their children—stayed with the Roche family in Branch. Dermot Roche’s son, Vince, pushes Aidan’s three sons, ca. 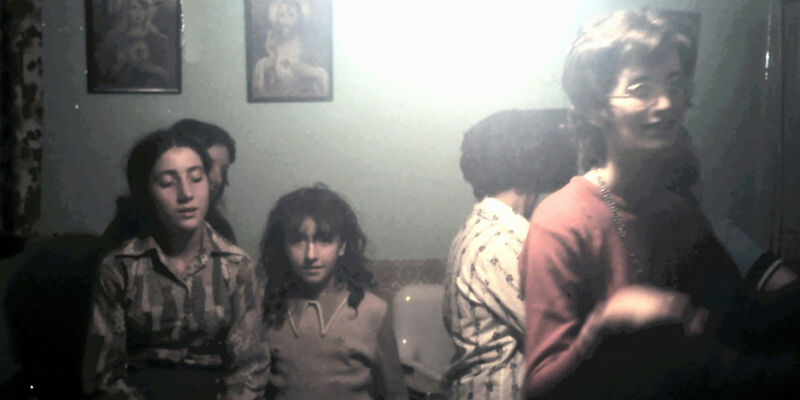 1975 (photo courtesy of Aidan O’Hara; used with permission). 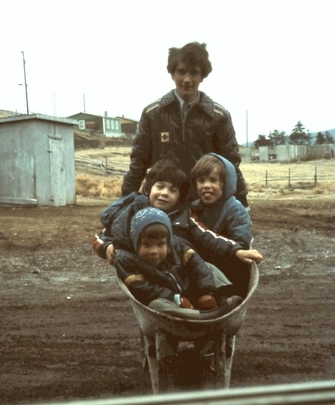 Aidan O'Hara's three young sons being pushed in a wheel barrow by Vincent Roche (son of Dermot Roche) through the yard at the Roche family house in Branch. Dermot’s home was the place where Aidan O’Hara and his family stayed whenever they came to visit Branch. 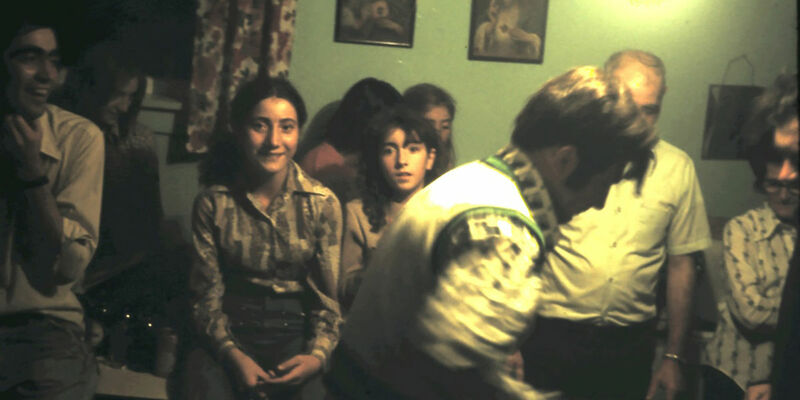 Though only a child at the time, Karen Sarro (née Roche), one of Dermot and Rita Roche’s children, recalls vividly the house parties, visits from an older generation, and the significance of the O’Haras' visits to the community. Aidan’s visits were always filled with fun—the music, the songs, the dancing, but also the laughter—it was a special time that we looked forward to. The older folks took pride in their knowledge of the past and were so happy reliving the moments and the telling of the old stories as well as recitations. It was a magical time that brought the community closer and gave us pride in our traditions. Karen Sarro to Rebecca Draisey-Collishaw on Aidan O’Hara’s visits to Branch (email, 26 January 2018). Aidan O’Hara’s visits to Branch were always occasions for a “time”: neighbours called over, songs were shared, and the music and dancing went on until the wee hours of the morning. Henry Power doing "a bit of a scuff" at the Roche's house (photo courtesy of Aidan O'Hara; used with permission). Frankie Nash plays the whistle while Rita Roche and her daughter look on (photo courtesy of Aidan O'Hara; used with permission). Lucy Nash (Caroline Brennan's foster daughter and Henry Nash's wife) dances a set with others at the Roche's house (photo courtesy of Aidan O'Hara; used with permission). 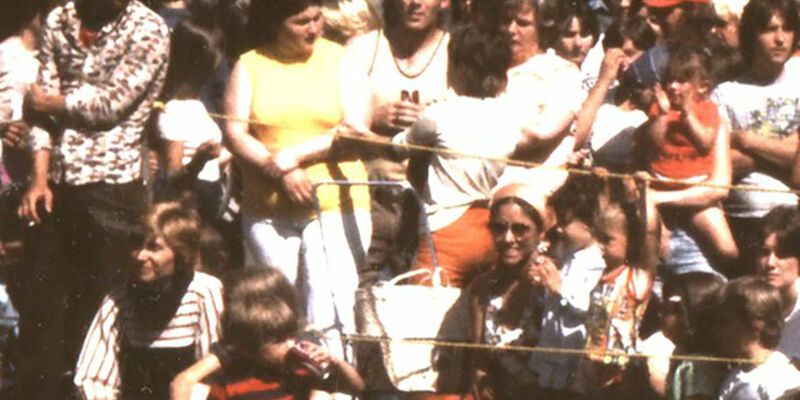 Monica "Mon" English (John Joe English's wife) watches the action of a "time" at the Roche's house (photo courtesy of Aidan O'Hara; used with permission). Siblings Rita Roche and Henry Nash enjoying themselves at a time in the Roche's house (photo courtesy of Aidan O'Hara; used with permission). View a gallery of photos from other "times" at the Roches' house. The majority of Aidan’s recording happened in the informal context of a “time.” The lively conviviality of such occasions was captured on film when Aidan returned to the Cape Shore a few years later with a Radharc production team. 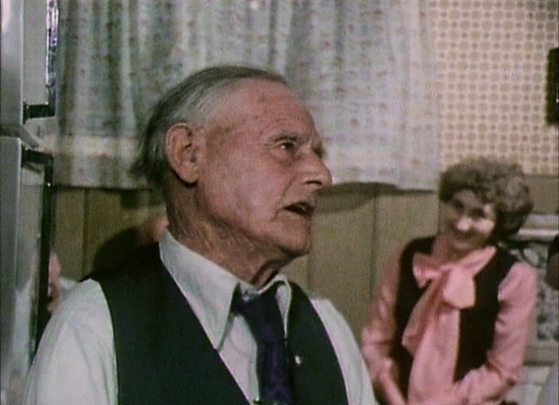 The opening scene from the 1981 documentary The Forgotten Irish features John Joe and Monica English, John and Helen Hennessy, Leo English and Rita Roche, and others dancing a set in the Roche family kitchen. Gerald Campbell was a popular guest at parties because of his skill on the accordion—“cardeen” in local parlance—and the harmonica. But the older generation knew how to make due in the absence of instruments. Mouth or “gob” music was a popular substitute when musicians were scarce. Patsy and Bride Judge of Patrick’s Cove, another community on the Cape Shore, describe some of the popular tunes from the area. They also detail when each tune was likely to be heard in a set. Patsy Judge performs several examples of “cheek” or “gob” music (i.e., dance music performed with the voice only), simultaneously explaining where these tunes were most likely to appear within the set dance. The examples appear in the following order: “There was an old woman” (jig), “Tatter Jack Walsh” (jig), “All the way to Connickmore” (single), “Haste to the wedding” (jig), “The girl I left behind me” (single), “Girls in the salthouse” (single), “Mother wouldn’t beat him” (single), “Irishman’s shanty” (single), “Pop goes the weasel” (jig), “Green grow the rushes-o” (reel). While set dancing got everyone up on their feet, certain individuals were known for their facility as solo step dancers. John Hennessy of Branch demonstrates a few steps while Gerald Campbell accompanies on the harmonica in another scene from The Forgotten Irish. Gerald Campbell plays singles on the harmonica while John Hennessy step dances in Dermot Roche’s kitchen (Courtesy of RTÉ Archives). A typed transcript of a conversation between Aidan O’Hara and Mick Nash. A typed transcript of a conversation between Aidan O'Hara and Mick Nash. Mick Nash describes a competition between a dance master from Ireland and a dance master from Angel's Cove. Song, though, was really the centre point of parties. One of the reasons Aidan and Joyce O’Hara found such a warm welcome in the communities of the Cape Shore was that they were folk singers with fine voices, eager to listen but also willing to share a song or two themselves. When Aidan brought out his Uher 4000 report reel-to-reel tape machine and set up a microphone, he wasn’t just taking songs from the Newfoundlanders who welcomed him; he was also contributing to the joy and vitality of local traditions. John Joe English sings for an audience of friends at the Roche house in Branch, Newfoundland, ca. August 1980. From the The Forgotten Irish (©Radharc 1981; used with permission). John Joe English sings for an audience of friends at the Roche house in Branch, Newfoundland, ca. August 1980. 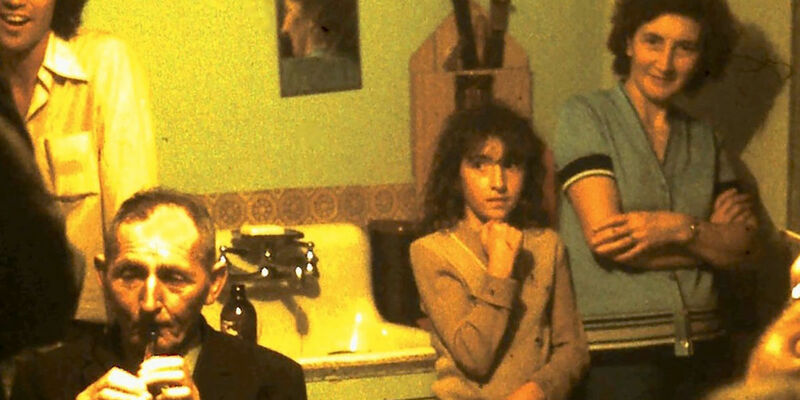 This image appears in Radharc's 1981 documentary The Forgotten Irish. All of the singers had their own party piece, so to speak. If Jack Mooney was present, for example, no one else would sing “The Irish colleen.” That was his song. The Irish colleen, song (I went to a party consisting of four …) This song describes a party at which four toasts are proposed: a Welsh girl toasts a leek, a Scottish girl toasts a thistle, an English girl toasts a rose, and an Irish girl toasts a shamrock and Ireland. Just before the battle, mother, song (Just before the battle, mother, I am thinking most of you …) Composed by George Frederick Root, the sheet music for this song was originally published in Chicago in 1863. It was quite popular during the American Civil War, particularly among Unionist soldiers. Henry Campbell, Gerald’s father, was mentioned by many of the singers whom Aidan O’Hara recorded as the person who had the words for long ballads that the old people of the Cape Shore sang. These included songs about shipwrecks, songs about going to war, but also ditties and long romances. The Roche’s home in Branch was Aidan’s base when he visited the Cape Shore, but from there he travelled around. He called into the homes of friends, neighbours, and relatives who were known to sing or share a story or two. That’s how he came to know Tom and Minnie Murphy of St Bride’s. Tom Murphy’s family were all known as good singers. It’s less clear where Minnie Murphy learned her songs. They just came easily to her when she was a young women. I could hear a song three or four times and then would just know it. 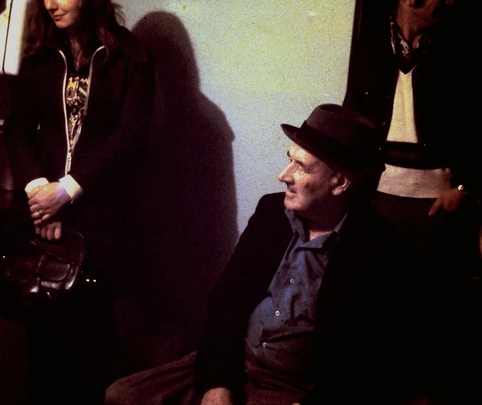 During visits in April and May 1976, Tom Murphy sang “The broken-hearted milkman,” a light-hearted song about a fickle woman. 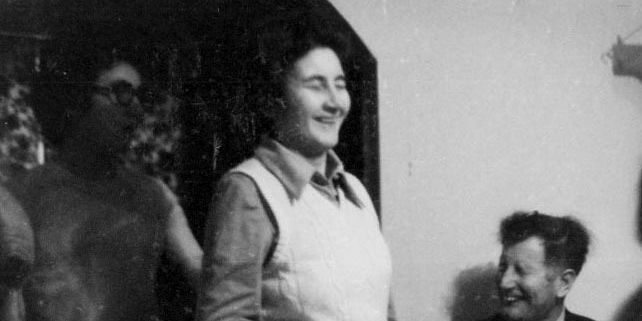 Minnie Murphy sang a song with a much more serious subject, “Down by the Riverside.” The song tells of an ill-fated marriage and a man who hangs in Wexford Gaol after murdering his wife. 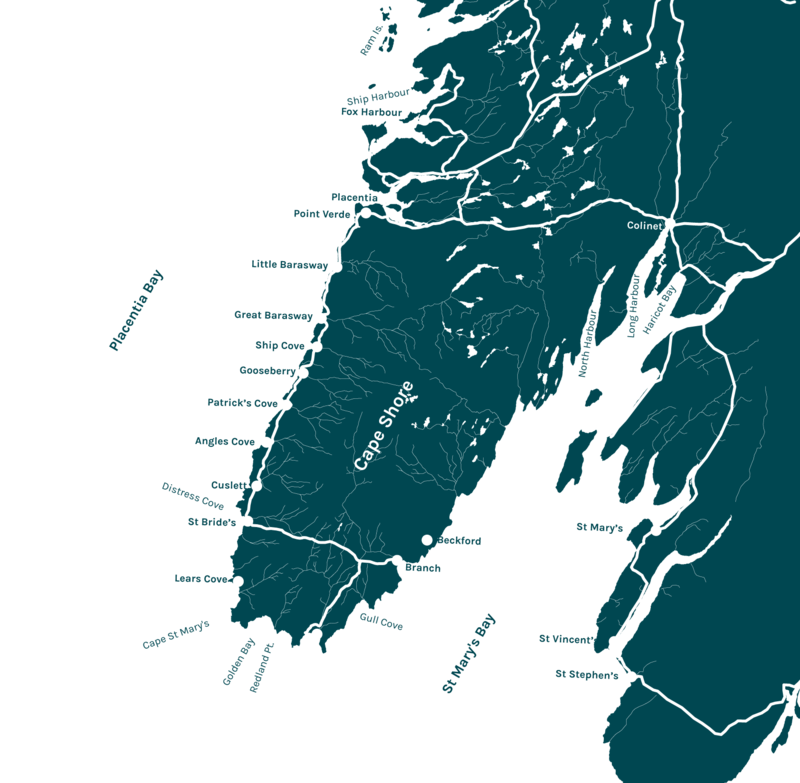 With the exception of an occasional come-all-ye, traditional singing in Newfoundland is typically a solo endeavour. However, Tom and Minnie Murphy enjoyed singing together. Rather than singing in unison, Tom and Minnie performed in parallel harmony—in a series of open 4ths and 5ths. Where they learned this approach remains unclear. Perhaps a clue lies in another recording of “The bonnie bunch of roses” by Cyril and Helen Whelan of Red Island, Placentia Bay. Collected by Eric West, in this recording the singers stop at the end of the first verse and Cyril comments that the problem of men and women singing together is that the key rarely suits both. Tom and Minnie Murphy may have developed their open harmonies as a way of avoiding this problem. Excerpts from an ITMA interview with Aidan O’Hara. Aidan describes a “time,” as well as some of him more intimate occasions for making recordings. These included conversations with Caroline Brennan of Ship Cove and Patsy & Bride Judge of Patrick’s Cove. Aidan O’Hara drew on his growing store of reel-to-reel recordings throughout the 1970s. Back in St John’s, he was working as a broadcaster. He presented the Saturday evening radio programme, Friends and Neighbours, for the Canadian Broadcasting Corporation (CBC). He was also a regular on a series that broadcast across all of Canada: All around the Circle. From the autumn of 1975, he also was the deputy head of School Broadcasts. All of these forums were opportunities to share the voices of “The Branch Crowd,” as they came to be known, with a provincial and national audience. 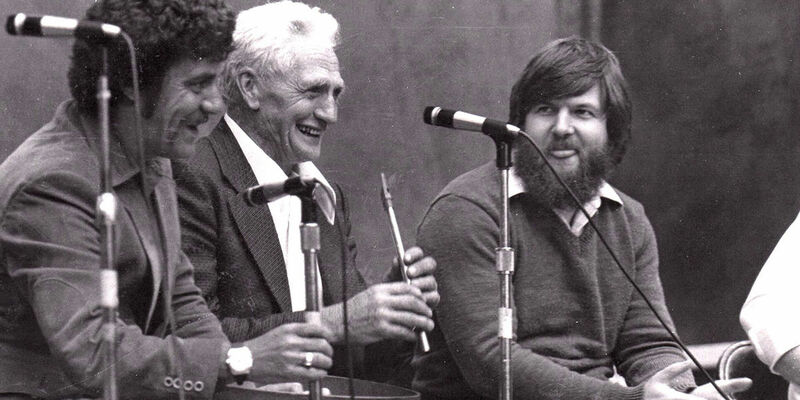 When Aidan O’Hara helped to found the St John’s Folk Festival (now known as the Newfoundland & Labrador Folk Festival), his first inclination was to include the musicians, singers, storytellers, and dancers from the Cape Shore. 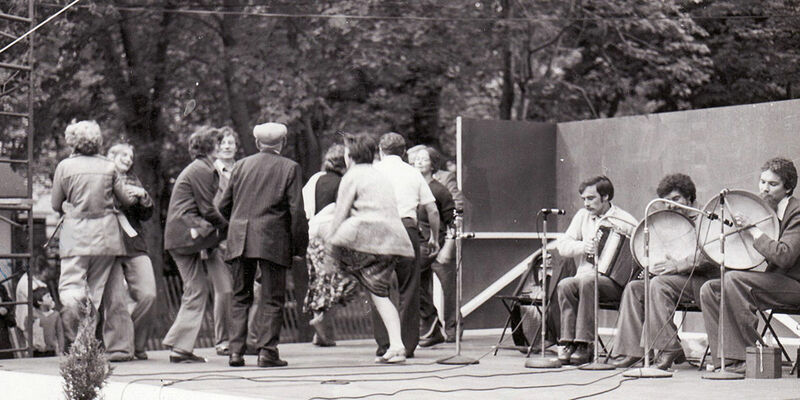 Images from the Folk Festivals held in 1977 and 1978 depict people like Patsy Judge, Anthony Power, Gerald Campbell, Jack Mooney, and John Joe English on stage performing. His role as the programme director of the festival for its first two years afforded him the opportunity to feature. The Branch Crowd dance a set on stage at the Newfoundland Folk Festival (photo courtesy of Aidan O'Hara; used with permission). Patsy Judge & friends on stage at the Newfoundland Folk Festival (photo courtesy of Aidan O'Hara; used with permission). A crowd gathered to watch the performances at the Newfoundland Folk Festival (photo courtesy of Aidan O'Hara; used with permission). Retrace Aidan O’Hara’s travels around the Cape Shore and meet the singers who generously allowed themselves to be recorded. Explore the galleries, playlist, and songsheets of A Grand Time to learn more about the unique traditions of the Cape Shore.